My name is Marleen and I’m from Estonia. I’m one of those unfortunate people who didn’t have enough courage during the university to do an Erasmus study in another country so when the end of my bachelor was near, I was 100% sure that I will do an internship abroad. I finished university on 19th of January and stepped on the plane to Catania on 20th. Today started the second week of my internship, although it feels like I’ve been here already a month. Not homesick at all! But this of course is thanks to the wonderful team who I’m working with – they’ve helped me from the beginning with different situations and introduced me to the rhythm of Eprojectconsult and the life of Barcellona. So how is the job? Since I started, I’ve had so many different tasks. Seems like there is no routine at all – you do this, you do that, you do aaaalll kinds of tasks that end up as a project. Last week we got an answer from an estonian organization interested in collaboration and I did a little happy dance 😊 cannot wait for the groups to start arriving to see project management from another perspective. And how is the life of Barcellona? Being from Estonia, I still cannot believe there is such a lunch break during the work day 😊 in my last job we were always discussing how we need that lunch sleep like back in the kinder garten – now I have it! And the palm trees! How can you not like palm trees? I made myself a few promises too, but let’s see what will figure out in six months. Oh, and there’s another intern here, his name is Jure and he’s also my flatmate (first time I´ve had one). He wrote you too! Here it goes..
My name is Jure Mudronja Pleša, I am from Zagreb, Croatia. I hold bachelor degree of Sociology from Faculty of Humanities and Social Sciences at University of Zagreb, Croatia, and I am about to finish my master degree, also at the University of Zagreb. Last year I was writing my final thesis for Master’s degree in Sociology, within Erasmus+ student mobility program, at Università degli Studi “G. d’Annunzio” Chieti – Pescara, Italy, so this is not my first Erasmus experience. Pescara is the place where all started for me, where I fell in love with Italy, so I just had to come back again. How did I decided to come here? Since in Croatia young people strive to find a new professional experience and try their luck in countries such as Germany, Ireland etc., I have decided to do something exactly opposite and headed myself to Sicily, a town called Barcellona Pozzo di Gotto. And let me tell you something! I didn’t make wrong decision. So far, by the end of my third week I can say that I am completely satisfied with everything here. 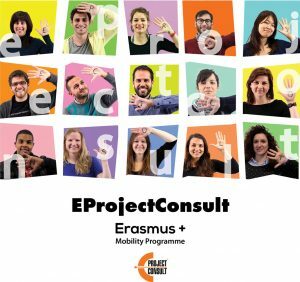 I must say that is great pleasure to work here with the multicultural team of EProjectConsult, friendly and nice colleagues who are always ready to give you advice or assistance. Although I had some doubts before coming here, that I would be just a “coffee-boy” who will just make coffee and won’t be entrusted with any tasks with a real responsibility, it is not like that all. From the first day I feel like an equal member of the team. To conclude I can just say that if you take a chance and step out your comfort zone great things can happen. Try it!